Saves Time: Family meal planning has really helped me save time. I do my grocery shopping one time per week. I typically go on Monday's, so by Sunday night I create a meal list for the week and then a grocery store list. I create my grocery store list based on the ingredients I need to prepare my meals from my weekly meal list. I have two toddler-aged children and I'm pregnant with Baby #3 so frolicking around the grocery is not the best way to spend my time. Going into the store with a list gets me in and out! Keeps Me Organized: Towards the end of my day the last thing I want to do is brainstorm a dinner plan. Going day by day and not knowing what I am going to cook gives me anxiety and usually keep me in the kitchen longer than my toddlers can tolerate. A family meal plan helps me to get in the kitchen, cook, and have dinner ready when my husband gets home. I do not like to guess what's for dinner a few hours before dinner is to be on the table. Planning ahead of time ensures that I have the proper ingredients for my meal. Promotes Healthier Eating: Prior to family meal planning I noticed that when we eat spontaneously we typically choose something quick & fast and in most cases unhealthy. When I sit and create a meal plan I have the opportunity to make sure the meal is balanced with the proper foods from the food guide pyramid. I like to know that I am providing my family with the proper amount of protein, fruit & vegetables, and grains. Seeing the meal in writing for the day and week helps me see the bigger picture. Helps Keep Me Out Of A Food Rut: As mentioned above unplanned eating usually results in unhealthy eating, but it can also lead to eating the same meals over and over again. Our taste buds get bored and so do our children. Family meal planning has helped me get creative with our meals, try new things, and to do my best to rotate our favorite meals. Pinterest has really become a great place for me to try new meals. There are many things that my family does not eat, meat being one of them, but meal planning makes it easy to make substitutions in any recipe you want to try! *Saves Money: Family meal planning has truly helped me save us some money. When I do go to the grocery store without a grocery list I end up buying a lot of stuff that we do not need, I buy too many snack foods, and I forget key ingredients. I also end up buying a lot more food, but nothing that can actually make a well balanced meal. When this happens I sadly have to go back to the grocery store so that I can buy more food to create good meals. Inevitably, this puts me over my grocery shopping budget for the entire month. Meal planning absolutely helps you stay within your weekly/monthly grocery shopping budget. Keeps Me Out Of The Kitchen: As mentioned above when I know what I am going to cook I can prepare better. Looking at my weekly meal plan everyday gives me direction in the kitchen. I know the night before if I need to take something out of the freezer, if I need to marinate something, if I need to soak dry beans, or anything else that needs a little preparation for a delicious meal. A little preparation goes a long way! When the time of the day comes to start cooking, based on the menu for the day, I know how much time I need in the kitchen and how much needs to be done before my husband gets home. Meal planning has also helped me to ensure that I have at least two meals on my menu that create a leftover. Leftovers mean no cooking; only warming and serving, so that's absolutely less time in the kitchen. It's Easy/How To Get Started: Family meal planning is a habit; a good habit. Forming a new habit takes consistency, time, patience, and commitment. If you want to family meal plan you can! Here's a few tips on getting started.... -Get a chalk board or dry erase board or anything else that you can write on and erase as needed. (If you cannot get a board right now start with a piece of regular sized paper). -Write the days of the week on your board. -Brainstorm what you would like to make for dinner to last until your next grocery shopping trip. As I mentioned grocery shopping one time per week is what works best for my family. Do what works best for your family. -Write down a meal for each day of the week. These meals are not set in stone, you can rearrange them as needed, but at least start with writing them down. -Be sure to add at least 1-2 meals on your weekly menu that will create a leftover. Some of our favorite leftover meals are tacos, enchiladas, lasagna, stir fry, chili, any pasta dish, etc. I know every family is different. Some love leftovers and some not so much, so you can get creative. For example: tacos one night, and then burritos the next night using the leftovers by changing how they are presented so it feels like a new meal. Do however many leftover meals per week that your family can tolerate. -Create your grocery list. Be sure to try to put all vegetables in the same place on your list, all fruit in same place, all refrigerated items, etc. This will save even more time in the grocery store, so you're not running back and forth to the same aisles over and over again. -Go grocery shopping according to your list and meal plan. -When your loved one calls and asks "What's for Dinner?" 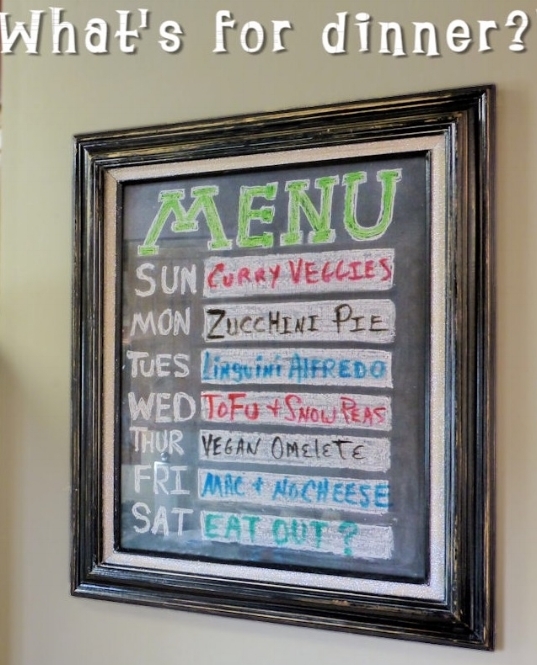 you can easily text a picture of your weekly meal menu board! *A Few Extra Money Saving Tips: -Do your meal planning and grocery shopping after you receive your weekly grocery ads and coupons. Meal plan, grocery shop, and eat according to what's on sale in your grocery store(s). -Be sure to do a weekly inventory of your pantry and refrigerator. This helps you keep key ingredients and staple items stocked and a great way to build meals based on what you already have at home, so that saves from buying more than you need. Check your calendar for Date Night's, special events, and other things that may impact your family's meal plan for that specific week. -When meal planning and grocery shopping eat your freshest food first. Since I grocery shop one time per week I have become mindful of what fruit and vegetables go bad the quickest. This knowledge has allowed me to create meals at the beginning of the week using these ingredients first. When food does go bad before I can use it I feel like I'm just throwing money out the window! -Crockpot meals are great for leftovers and for spending less time in the kitchen. Explore more Corckpot recipes. -A few last things that I've mastered with family meal planning over time is doing easier, faster meals on the weekends, so you spend less time in the kitchen and more time with your family. For example: on the weekends we may do something easy like a big salad, veggie burgers and sweet potatoe fries, or homemade pizza for Friday Family Night. The kids make their own pizza and eat whatever pizza they create while we watch a family movie. I also try to keep the family meal plan balanced. Once I create the meal plan I look at it to make sure there aren't too many meals with pasta, potatoes, fried food, etc. Family Meal Planning can be very helpful. These tips are what I have found to be helpful for my family. If you have some great tips to share please do! I'm always open to suggestions on how to make things easier, more organized, and to save time and money. There's also tons of grocery shopping apps. I have not found one that does all that I need it to do so if you have suggestions, please send them my way. Don't give up on creating this new habit, be kind to yourself, and just get started! My family meal plan isn't perfect for everyone, but it's perfect for my family. Lastly, once you master the weekly meal plan challenge yourself to try to a monthly meal plan! Enjoy! Sample of a family's completed Meal Plan.